Re: SECRET SCHNOZ 2015! Sign ups until Nov 15th!! Thank you guys! It's something I look forward to drawing every year. Count me in again!! I had a blast last year, and I would love to do it again this year! Count me in, too! I look forward to this every year. Sounds like fun! Love the Schnoz banners, Grail! Thanks folks! Glad to have you all on board this year! Just posting a quick reminder to everyone, we're accepting entries through this Sunday! Re: Re: SECRET SCHNOZ 2015! Gift time!! Re: SECRET SCHNOZ 2015! Gift time!! What fancy-looking wrapping! I'm excited to find out what you got! 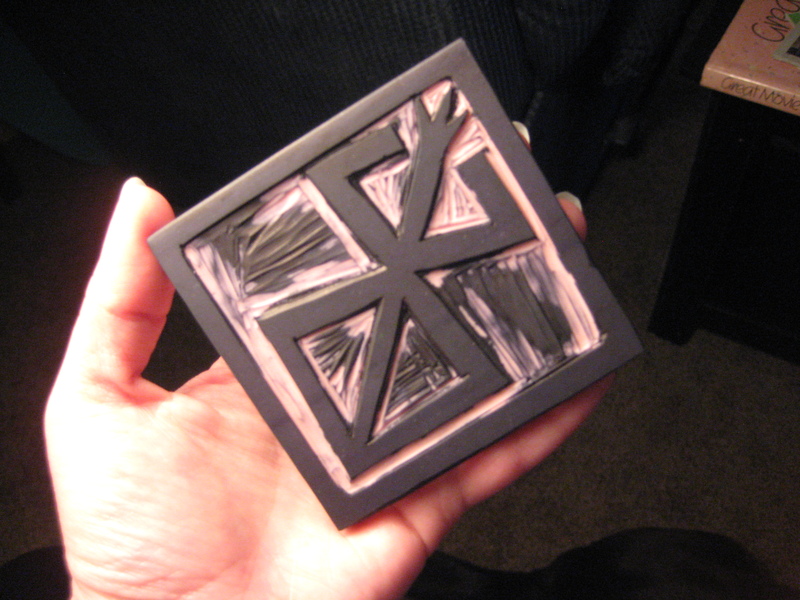 As for me, I'm putting the finishing touches on my gift before sending it this week. This is a good time to remind folks who are participating this year: if you haven't done so already, please remember to let me and Incantation know when you send your gift out, so that we can keep track of what's going on. Thanks everyone! I received my gift a few days ago, but I'm lazy, so I'm just now posting about it. Unfortunately, I don't know who sent it to me, because there wasn't a name on the return address on the package, or anything inside that indicated who it was from. My ninja skills are improving! I hope you enjoy it! Also, Amazon is lacking in the "being sure to include the gift message" department they seem to be big on. This is the third time they haven't included one in something I sent! You could always email jeff@amazon.com about this, including relevant information about each order. That would probably guarantee that such a thing does not happen again. Would likely ruin a few people's day as well. Oh wow, awesome! Thanks, Aaz! Thanks, man! I'm hoping to watch it this weekend. It's my favorite Pixar movie. A box came in the mail yesterday! I'm so excited! I can't wait to open it! I know I'm a bit late, but I will be sending off my gift tomorrow!! It's an original piece of art -- so trying to find the time to make something as my Internship is coming to an end has been tough!! I hope it makes it there before Christmas!! A handmade gift is always worth the wait! I hope it arrives on time too. I'm glad that folks have started receiving their presents! I sent mine out yesterday. Oohh look at this BOX! THE WRAPPING PAPER!! OH MY GOD YOU ARE AWESOME!! This made me laugh so hard. I was actually expecting a "Beer Beard" to be inside this box (and I absolutely would've used it at work). But. . . WHOAAA!! TWIN PEAKS BUTTONS AND A DECAL!! THANK YOU!! I've been absolutely obsessed with Twin Peaks lately. I'm late to the party as always but only this year have I discovered the genius that is David Lynch. 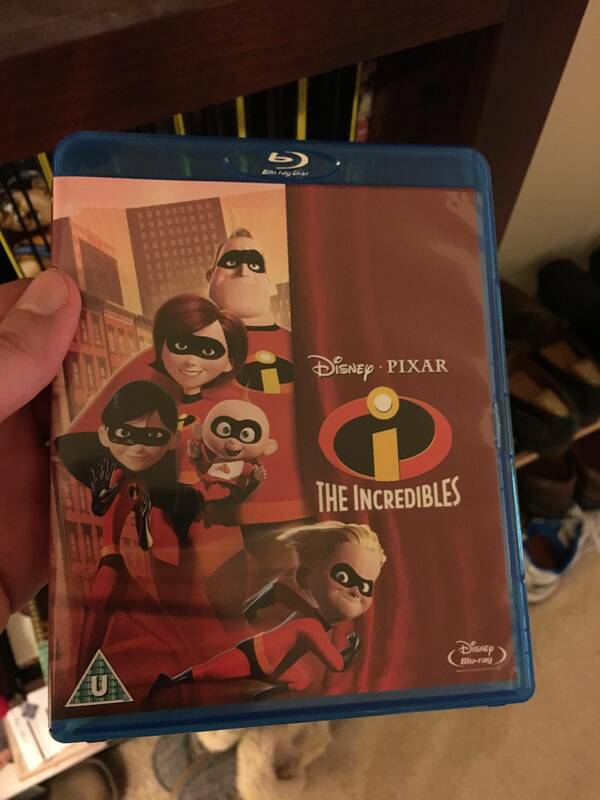 THE BEST DISNEY MOVIE ON BLU-RAY! THANK YOU THANK YOU THANK YOU!! 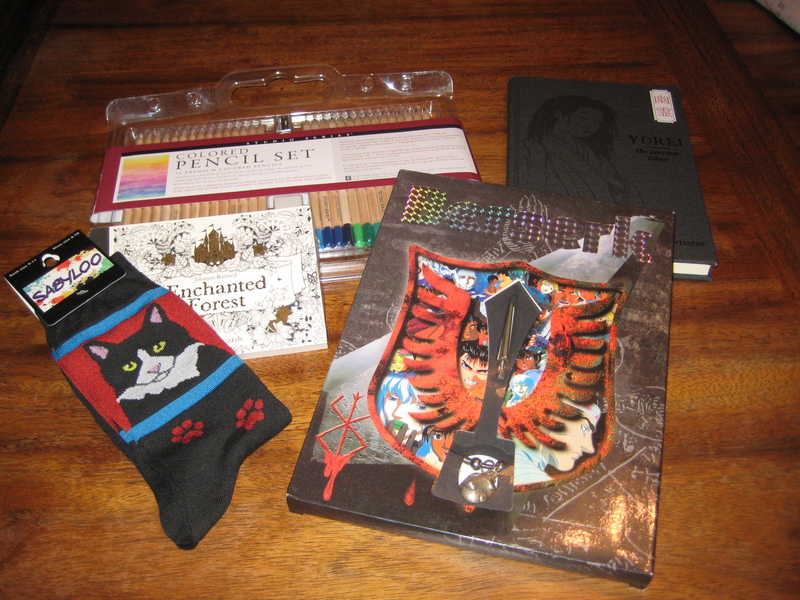 Overall I am very happy with my gifts and I had a lot of fun participating in this. Thank you for hosting as always, Grail and Incantation! I got my present from Grail!!! What a lucky soul am I! I didn't take any photos sadly, but I am simply overjoyed! 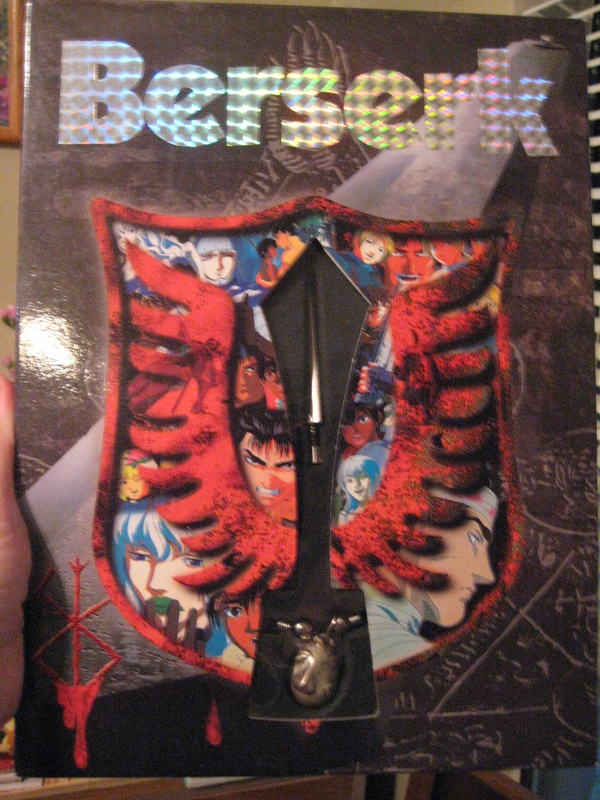 I got volume 33 of Berserk: one more closer to finishing my collection!! Only 8 more to go! Thank you very much!! I hope my recipient has gotten her gift!! Received my gifts from Gobs sometime last week and hadn't had the chance to say thank you, so thank you for Brook! Hey there, I hope everyone is enjoying a happy Holiday season this year! Thank you JMP! I love my presents! I'm so glad you like them and had fun opening them. I had a blast making the wrapping paper and putting your gift together. I woke up this morning excited to find out what was in the box I had received, when what to my wondering eyes did appear but a treasure trove of awesome from my secret Schnoz! I am bowled over by your generosity. 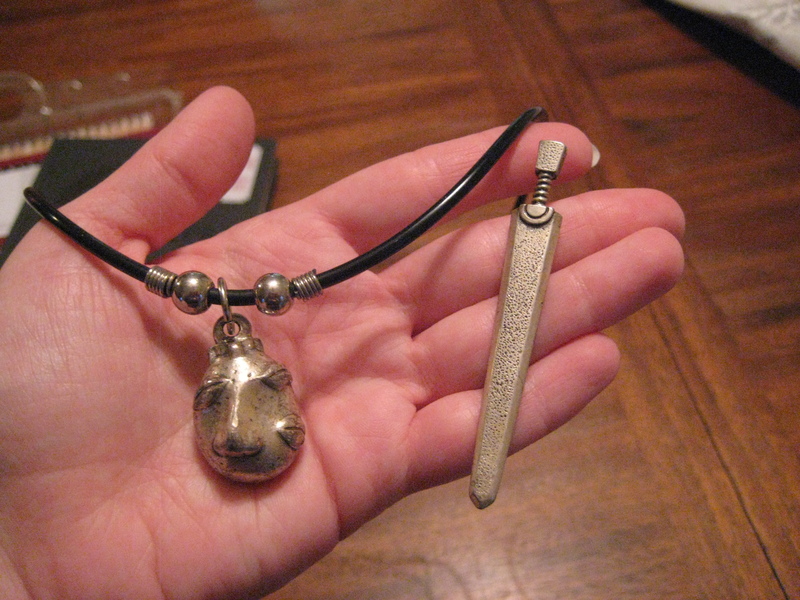 I love everything you sent me, especially that sweet beherit necklace and miniature Dragon Slayer set. So freaking cool!!! Thank you SO much, IncantatioN!!! The beherit and mini Dragon Slayer. This was so much fun! Thank you for organizing it, Grail and IncantaioN! Wow, looks like a great crop of presents this year! Thanks to everyone who participated! JMP, we were so impressed with your wrapping paper! How'd you make it? Jackolyn, I'm so glad you're enjoying your gifts!! I ended up having to put that frame in the mail a little too soon after putting the wood lacquer on, so I hope it didn't stick to the wrapping paper. I think my gift should be arriving soon, so I'll post pictures once it arrives! I got my gift from Rhombaad the other day and got some awesome stuff! 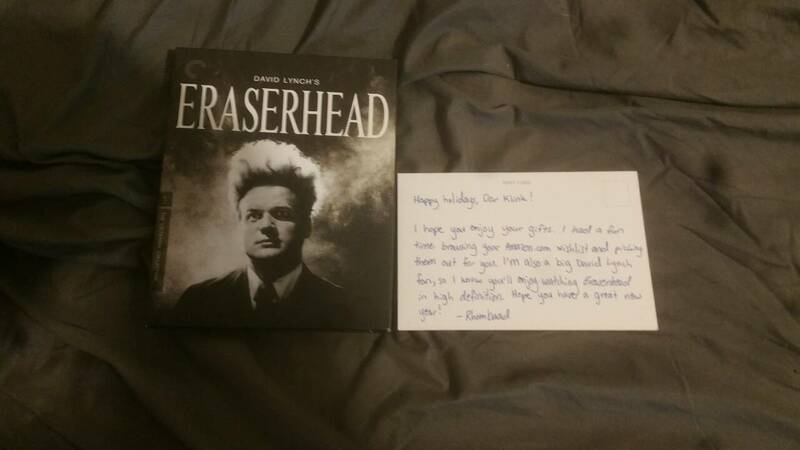 An Eraserhead bluray I've been eyeing as well as some volumes of Berserk to help round out my collection. Hurray for Lynch solidarity Gobby! Thanks Rhomby, I'll probably watch the movie tonight or tomorrow! I'm really excited to see it in Criterion quality! I also had another present come from my Schnoz yesterday. 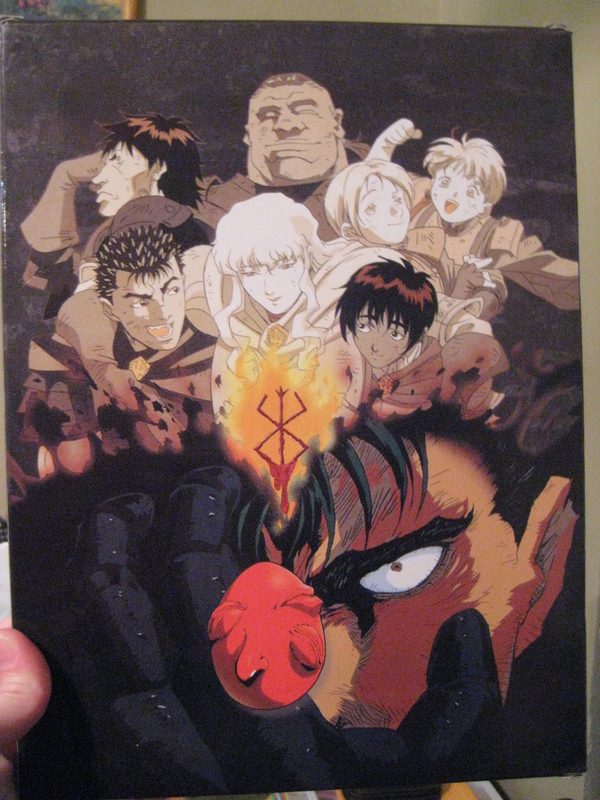 It hadn't made it into the original box, so he mailed it to me separately. 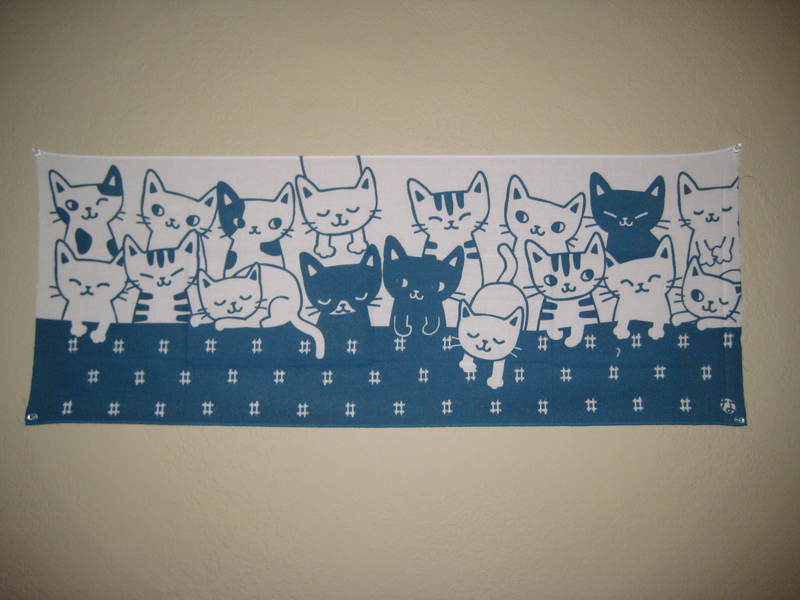 It's an adorable Japanese cloth print of cats. I hung it up on my wall and it looks really cute! You were much too generous to me, IncantatioN! Thank you so much once again!!! Now THAT'S a good gift!